In stock -This product will ship today if ordered within the next 1 hours and 58 minutes. 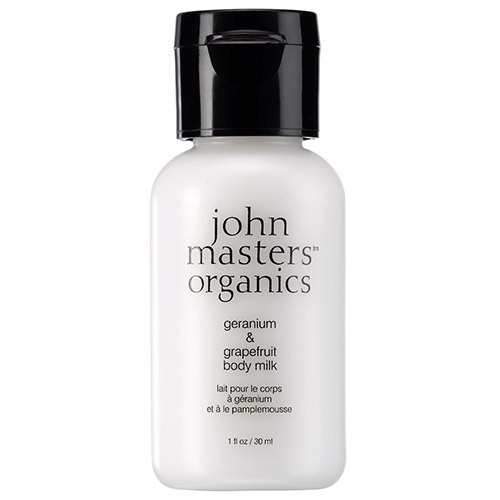 Essential oils of geranium, grapefruit and lavender tone and protect, while offering a clean, invigorating scent. Perfect for use all over the body. This newly improved formula absorbs more quickly and provides extra moisture and softness, with 8 certified organic ingredients. Aloe barbadensis (aloe vera) leaf juice*, sodium lauryl sulfoacetate, aqua (water), decyl glucoside, sodium cocoyl glutamate, pelargonium graveolens (geranium) flower oil, barosma betulina (buchu) leaf oil, citrus paradisi (grapefruit) peel oil*, citrus aurantium dulcis (orange) flower oil, silybum marianum (milk thistle) extract*, vanilla planifolia (vanilla) bean extract*, arnica montana (arnica) flower extract*, calendula officinalis (calendula) flower extract*, chamomilla recutica (chamomile) flower extract*, lavandula angustifolia (lavender) oil*, camellia sinensis (green tea) leaf extract*, glyceryl cocoate, helianthus annuus (sunflower) seed oil*, linum usitatissmum (linseed) seed oil*, borago officinalis (borage) seed oil*, panthenol (vitamin B), glycerin, sodium hyaluronate (hyaluronic acid), hydrolyzed soy protein, allantoin, sodium benzoate, potassium sorbate. Apply liberally to body after cleansing with Body Wash.
Below are reviews of Geranium & Grapefruit - Body Milk - 30ml by bodykind customers. If you have tried this product we'd love to hear what you think so please leave a review.